Linalool is a natural active ingredient of plant origin used in veterinary medicine mainly in dogs and cats against some external parasites (lice, fleas, flies, etc). It is also used against agricultural and household pests. Other names: β-linalool, linalyl alcohol, linaloyl oxide, p-linalool, allo-ocimenol, and 3,7-dimethyl-1,6-octadien-3-ol. Main veterinary parasites controlled: mosquitoes, fleas, etc. Mechanism of action: Little is known about the molecular mechanism of action of linalool. It is thought to be neurotoxic and to act upon sensory cells increasing their activity. Such cells send wrong signals to the muscles causing tremors, convulsions and loss of coordination. It seems that it can also affect the central nervous system leading to hyperstimulation of motor neurons. All this can quickly cause paralysis of the affected insects. However, they can recover quite quickly unless linalool is administered together with PBO (piperonyl butoxide), a synergist that potentiates its efficacy. A certain repellent effect has also been reported for linalool. Linalool oxidized by air can cause allergic reactions, particularla in patients affected by eczema (dermatitis). Otherwise linalool is considered as rather safe for humans, domestic animals and the environment. Nowaday linalool is manufactured mainly by industrial chemical synthesis. Annual production was estimated to reach 12'000 tons in 2000. Linalool is a natural terpene alcohol produced by more than 200 plant species. It has two optic isomers S-linalool and R-linalool. Both have a characteristic odor and are used a lot in perfumes, cosmetics and other personal and home-care products (soaps, shampoos, detergents, air fresheners, etc). It is estimated that 60-80% of such products contain linalool. Linalool is also a component in certain wines (e.g. muscatel). 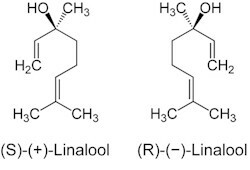 Linalool is also used in industrial synthesis, e.g. a common downstream product of linalool is vitamin E.
S-linalool is also known as coriandrol. It has a coriander-type odor. 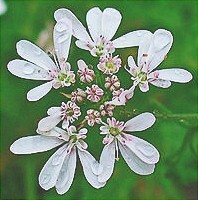 It is one of the main constituents of coriander oil (Coriandrum sativum), palmarosa oil (Cymbopogon martinii ; up to 90% S-linalool), and sweet orange (Citrus x sinensis). R-linalool is also known as licareol. It has a lavender-type odor. It is a main constituent of lavender oil (Lavandula officinalis), laurel oil (Laurus nobilis), and basil oil (Ocimum basilicum). Use of linalool as an insecticide or insect repellent against crop, household or veterinary pests is irrelevant when compared with its industrial usage. Linalool shares two features with many other natural insecticides: it is rather volatile and is unstable when exposed to sunlight. Consequently its effect in animals exposed to sunlight is very short: a few days or even only a few hours. This means that protection of the treated animals against re-infestations (residual effect) is virtually inexistent. This is particularly unfavorable for livestock that would need to be treated very frequently. However, for the same reason they do not leave chemical residues in food commodities (meat, milk, eggs, etc. ), which is a benefit sought by organic producers.